Cramer's Crossing Homeowners Association, Inc.
You must use the Homeowner Login to access the Homeowners Only section of this website (located in the upper right corner of this page). If you need login credentials or have forgotten your User Name or Password, please contact webmaster@cramerscrossing.org. IMPORTANT: Planning any exterior work on your home? The CCHOA Required Procedure and Exterior Change Form has been revised by the CCHOA Board. This form can be found in the HOMEOWNER DOCUMENT LIBRARY under CCHOA FORMS, then click on Design Control Standards Forms. You must LOGIN first to access the Document Library. Cramer's Crossing is a small neighborhood of 79 homes located near the intersection of Rings and Avery Roads in the southwestern part of Dublin, Ohio. Our community was named after Cramer Run which passes through the subdivision. Cramer's Crossing features 14 acres of green space, 2 ponds with fountains, a bike/walking path, a shelter house and a gazebo, both with charcoal grills. Our community is adjacent to Dalmore Park, which includes a basketball court, playground, bicycle racks and a bocce ball court. Construction of Cramer's Crossing began in 2002 and was completed in 2007. The streets in our community are Stockton Way, Sumner Loop, Morrisey Place and Pensworthy Drive. Cramer's Crossing Drive provides primary access to our subdivision and to the adjoining condominium complex, Cramer's Crossing Village (the condominiums have their own homeowners association). A second entrance is located at Rings Road on the south. 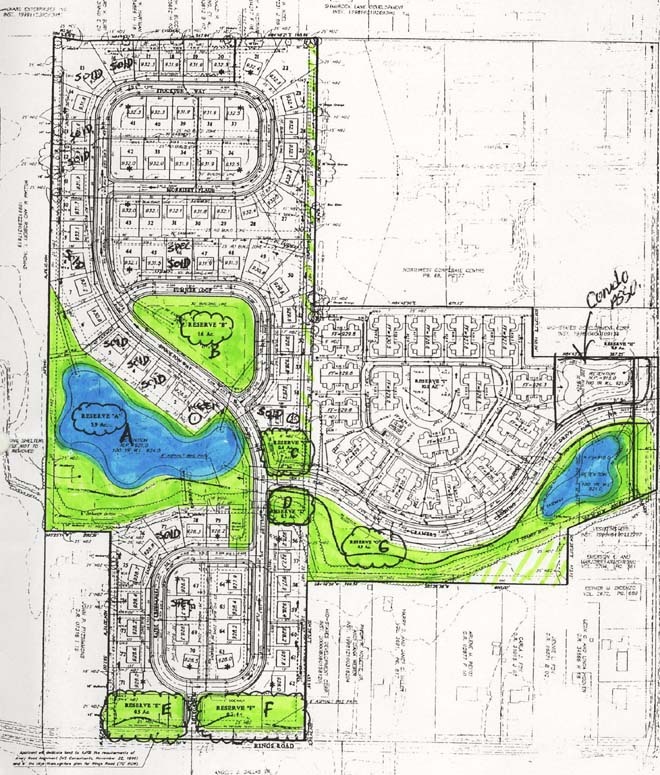 Development plans for what eventually became Cramer's Crossing began in 1996. At that time the plan submitted by Rockford Homes called for 207 multi-family units, 2 one acre single family lots and 2.7 acres of office space. That plan was modified in late 1997 to include 256 apartments and 71 single family homes and would have been called Avery Village Commons. This proposal was turned down by Dublin city officials because it exceeded the density limits for the area. Rockford submitted a new development plan in 1999 using the name Cramer's Crossing. This plan scaled back the density of the project from 327 units to 145 by eliminating the 256 apartments and replacing them with 64 condominiums. Original plans called for 81 single family homes, but due to some lot size changes the final total was 79. Click on the image below to see the final subdivision plan. The reserve areas are highlighted in green, the ponds in blue. A satellite view of Cramer's Crossing from Google Maps. For a larger version click on the image. The Cramer's Crossing Homeowners Association, Inc. was formed by the subdivision developer (Rockford Homes) in 2002 when construction began. The homeowners took control of the organization in December 2006. The Cramer's Crossing Homeowners Association is not affiliated with the Cramer's Crossing Village Condominium Association. This web site is owned by and maintained exclusively for members of the Cramer's Crossing Homeowners Association. Copyright © 2019 Cramer's Crossing Homeowners Association, Inc.